Through the freezing temperatures, the mixture of rain, snow and sleet, and the blustery winds blowing off the Bay that make this a true winter garden spot in the South – and with Christmas Eve with temps in the 80’s a distant memory – crews have persevered and continued to move along on the Lesner Bridge Replacement project. Exactly how and what is better explained by the project manager and a favorite of bridge groupies everywhere – Chris Wojtowicz. So, to be really informed, keep scrolling down and read the informative update that Chris has supplied us while freezing his . . . cheeks off . . . . on the bridge project site. Thanks again for all of your interest and patience throughout this project. Please be careful during these icy times and if you happen to be riding by the site and see Chris freezing out there, stop and pet him on the head and give him something hot to drink. He’ll be your friend for life! Ø We completed conduit and duct installation on the east side of the bridge behind Abutment B. The wet, cool, and windy weather is slowing our progress since we need the mating surfaces of the concrete segments to be dry and at or above 40° F in order for us to apply the water sealing epoxy prior to joining the segments together. Wind is the other constraint that we have in operating the gantry crane and it cannot be operated when the wind is gusting above 30 MPH. Winter work next to Chesapeake Bay and over Lynnhaven Inlet has been a challenge for us these last several weeks. Span 4 of the new westbound bridge was scheduled to be completed by 1/20/2016, but the various winter weather events and the upcoming cold and windy forecast have caused that schedule to slip at least until 2/19/2016. Considering this current delay, the new westbound bridge is now expected to be complete by August 2016, and the traffic switch moved to the new bridge sometime in September 2016. The contractor is now making Saturdays and some Sundays regular work days in an effort to make up some of this lost schedule. Although critical construction work has slowed on the bridge superstructure, other non-critical work on the bridge substructure continues. The steel reinforcement for pier column 7 has been tied is being readied for placement on the recently completed footing. The column formwork has been removed from pier column 5 and will be moved to pier 7 to form up the new column. At the same time, all of the epoxy coating on the completed footing at pier 9 has been applied and all of the shoring removed and re-installed at pier 8. Excavation for the footing at pier 8 continues and will be completed this week. By 2/12/2016, we expect to have the column for pier 7 fully formed and the footing for pier 8 excavated, the drilled shaft foundations cut down to plan elevations, and footing formwork installed. We are also aware of several potholes that have formed on the east side of the bridge along the westbound lanes between the bridge and Page Avenue. We expect to have them filled before the end of the week. Many of you have also phoned and emailed about our construction camera being down. For a variety of reasons, this camera has been offline more often than not. The camera is working now and we hope that we have corrected the operating issues. We have also installed a second camera on the east side of the inlet to better document our work as the bridge construction continues to progress to the east side of the inlet. 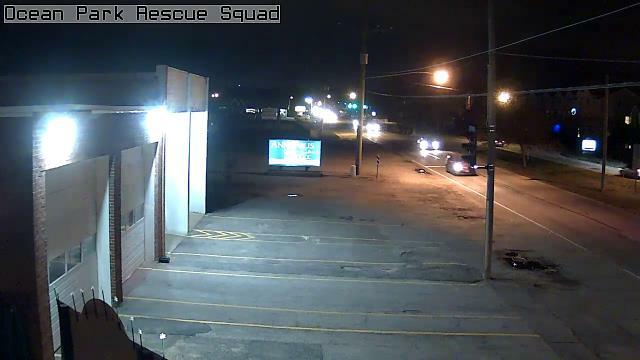 This second camera is available from the same internet link as the original one provided at http://www.vbgov.com/lesner-bridge.com If this link does not work, please try http://www.workzonecam.com/projects/rshcs Thank you all for alerting us to this issue. Utility installation inside the completed bridge spans has also begun. This work will continue and will be timed such that as the last span of the bridge is completed, the internal utility installation will also be near completion. This work is critical in relocating the various utilities from the existing bridges to the new westbound bridge within an acceptable timeframe so as to not delay the start of the old bridge demolition and new eastbound bridge construction. AMI, Inc. in Portsmouth, continues to build the new westbound bridge segments. A total of 115 of the 168 bridge segments have been cast. Ø Install the new storm drain structures along East Stratford Street on the north side of Shore Drive. I have fished around/under that bridge since 1969. Wiil that area be reopened to the public after the new bridge is completed ? ?